For Refugee Week 2016, we piloted a new project: an immigration workshop offering practical advice to Syrian refugees on family reunions. There is a lack of free legal advice for refugees and asylum seekers wishing to bring their families to the UK. Many of those who have found sanctuary in the UK fear for the safety of loved ones still in Syria or in neighbouring countries. We aim to hold more workshops in partnership with Syrian community groups around the country. Our workshop provided refugees with guidance in English and Arabic, now available as a PDF with clickable links to take you to useful web pages. 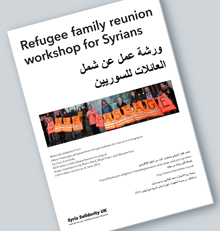 View and download the PDF: Refugee family reunion workshop for Syrians.